At this year's Google I/O conference, the installed base for the latest release of Android (from a year ago) fell by 20 percent compared to just one year ago, while users stuck on very old versions of Android (four years old or even older) increased by 120 percent, now making up a quarter of Google's active users. In 2013, just 4.8 percent of Android's installed base was stuck on a version of Android that old. It was a problem back then, but it's a crisis level catastrophe today. Previous efforts to turn things around and get more users on its latest software release, such as 2011's Android Update Alliance and 2014's Google One, have ended in failure. The enthusiast answer to Google's problem with backward progress in Android deployment is that it doesn't matter what version of Android users are running, because more of a phone's software can be updated as part of Google Play. That's true to an extent, and Google's Instant Apps addressed the fact that an increasing number of Android users are stuck on an older platform by announcing support back to 2012's release of Jelly Bean. 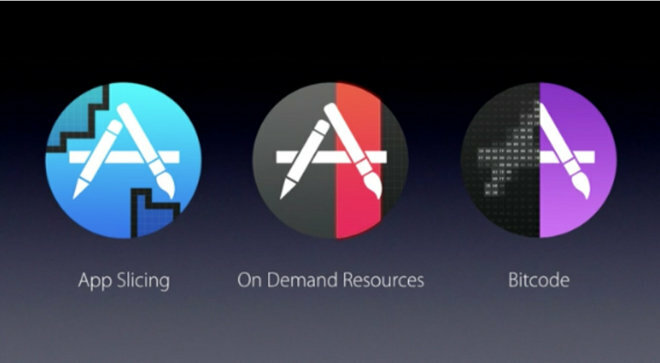 The technology involved is similar in some respects to Apple's App Thinning introduced at WWDC last year, which customizes and optimizes the components of an App Store title to be appropriate for the iOS device that downloads it. App Thinning directly addresses issues related to download size and the amount of storage taken up on the users' device. Instant Apps differs in that it is designed to modularize Android apps so that just the components that are immediately needed can be downloaded on the fly. It was presented by Google as being a solution to avoid the need for users to manually download an app they might only rarely use, such as a specific store's shopping app. Instead, just the components needed to present the results of a Google search are downloaded. Who has this problem? In reality the problem Instant Apps actually aims to solve is not so much a problem for users, nor even really the problem with OS level fragmentation in Android. It's the problem of Google search trying to remain relevant in the mobile world. In reality the problem Instant Apps actually aims to solve is not so much a problem for users, nor even really the problem with OS level fragmentation in Android. It's the problem of Google search trying to remain relevant in the mobile world. The problem of the user not getting to the result Google is recommending is a bigger problem for Google than the user, because while the user is likely to eventually solve their own problem somehow (perhaps by downloading that app or a similar one later on), without capturing the user's attention long enough to complete a sale, Google can't get paid. Virtually all of the money Google makes is tied to its ability to facilitate an online sale, completing the link between an ad or paid-placement search result and a financial transaction paid for by the user. If users discover apps on their own, Google doesn't get paid. Unlike Google search on a PC, where users end up on a web page where they can immediately buy something or be tracked by a cookie showing that they arrived via Google's search, Google searches on mobile can't just drop the user on a mobile web page. Mobile users expect the conveniences of a native app. In fact, way back in 2010 Steve Jobs observed that mobile users were shifting their behaviors from the earlier PC era. "On a desktop, its about search," Jobs said. "On mobile, search hasn't happened. People aren't searching on their phones. People are spending their time in apps." Despite all of Google's efforts to splash a prominent search bar across the Android desktop, and to move users toward an always-listening microphone that is breathlessly waiting for some sort of question to answer, the majority of mobile users download apps and use them to find whatever they are looking for. Last year, Google released plans for "app indexing and deep linking" that attempted to create the equivalent of web URLs within third party apps, enabling Google's mobile search to provide results that ended up within a user's app. The biggest problem Google now faces is that it has zero control over the iOS desktop. Last year, Apple deployed its own Spotlight Search to recommend apps and even deep link to those same kind of buried results within an app (such as a product page in a shopping app or a specific restaurant in a food delivery app). Google has also been pushed out of the important search bars in iOS Maps and by Siri and most recently News, all of which handle user's queries with Apple's own servers, or its partners'. Google's remaining search field on iOS is in the web browser, but apart from searching for general interest items, this spot is increasingly less valuable because so much of the relevant search related to apps on iOS is now handled by the App Store, the obvious place to look for new apps. Google's been doing a valiant job of working to provide web search results that are often better than Apple's, but that doesn't matter if users default to using the App Store to find their apps. 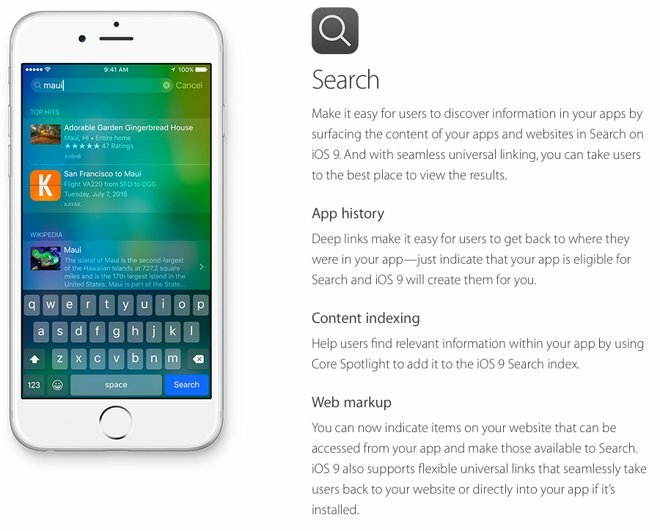 Further, Apple is continuing to work to improve its app search and recommendations engine. While Instant Apps helps to address problems Google is facing on Android, it does nothing for Apple's platform (which is more important to Google, because Google makes more money from iPhone users than it does from its own, larger Android demographic). Google can't launch an iOS App Store, and it can't make its search results load iOS titles any faster. On top of that, Apple is also doubling down on promoting the fact that the search services do not track users in order to create a behavioral profile it can use to sell advertising. 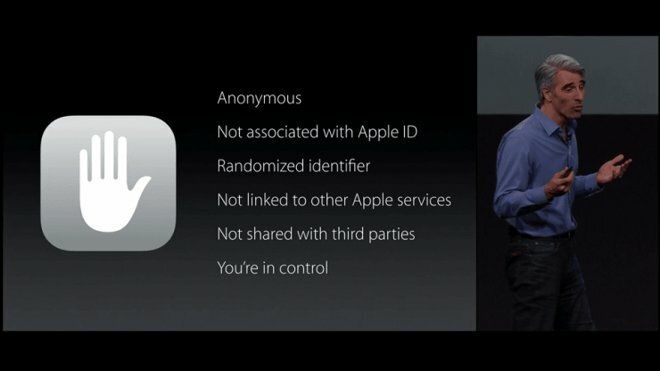 Last year, Apple's head of software platforms Craig Federighi emphasized in his WWDC presentation that the new predictive, proactive search services in iOS 9 and OS X 10.12 would be anonymous, not linked to the user's Apple ID or to other Apple services, use a randomized identifier, and not share data with third parties. It's noteworthy that Android originated back in 2005, not first as a copy of iPhone, but initially as an attempt to cut through Microsoft's then-threatening control over devices, with Windows Mobile on smartphones and Windows Vista looming for PCs. Android initially intended to offer an alternative mobile OS that would remain open to Google's own search, preempting Microsoft from weaning its users off of Google's search teat. Microsoft planned to build and integrate its own search results into Vista and Windows Mobile, cutting Google's search supply lines right at the operating system level, just as it had previously cut off Netscape, Sun Java and Apple's Quicktime on desktop Windows PCs, replacing them with its own proprietary web browser, applets and media playback components. It turned out that Google's fears a decade ago were overblown. Apple's iPhone destroyed Windows Mobile immediately, and Vista's tight integration with Microsoft's own search failed to catch on among PC users. Rather than remaining a partner with Apple, however, Google attempted to use Android to destroy Apple. That plan backfired. While Android quickly took the place of Symbian and Windows Mobile as the mobile platform of Sony, LG, Samsung and HTC, it turned out that the demographic it attracted wasn't worth very much. Add in the behavioral shift toward apps (which was initiated by Apple's iOS; other platforms continued to rely heavily on the web), and it ended up that Google needed Apple slightly more than Apple needed Google. It's not good enough for Google to slightly outpace Apple's progress in search and AI, because as Microsoft proved a decade ago, being the default app is better than being better. It's also the perfect perch from which to observe any superior ideas your competition is working on in order to maintain close parity with them--close enough to prevent defection. That's exactly what Apple is now doing. And Apple is doing a much better job at keeping up with Google's search than Microsoft was at converting Google searches to Bing. And because Apple isn't in a monopoly position, Google can't demand that the government force Apple to give it prominent placement on its own platform. While its ability to control the valuable demographic of users on Apple's iOS looms as an issue, Google also faces a more serious problem of its own making, as the next article will examine.